If you’re looking for a winter salad that’s easy on the eye and packs a punch taste-wise then this is the salad for you. You can leave out the goat’s cheese if you’re vegan or dairy free or you can replace it with another type of cheese such as Feta if you’re not so hot on goat’s cheese. 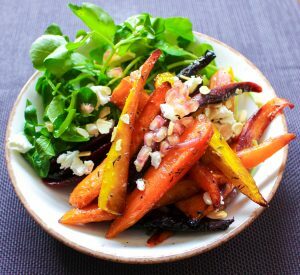 The sour goat’s cheese in this salad compliments the earthy, sweet flavour of the carrots which are roasted in some fresh orange juice to go with the peppery watercress leaves. A perfect combination. Peel the carots and cut into quarters lengthways. Bring a pot of salted water to the boil. To avoid the pigment the purple carrots bleeding into the other carrots, cook the carrots in batches starting with the yellow ones, then the orange then the purple. Blanch each for about four minutes before removing with a slotted spoon and setting aside. Pre-heat the oven to 180C. Place the drained carrots on a baking tray and season with salt and pepper, cumin seeds, thyme, orange juice and olive oil. Roast for about 20 minutes or until you see the carrots taking on some colour. Remove the carrots from the oven then sprinkle with a dash of white balsamic vinegar and allow to cool slightly before assembling the salad. Cut the pomegranate in half then hold it over another large mixing bowl. Hold the pomegranate as though you are holding a disposable coffee cup (for example) fruit face down. Squeeze the fruit whilst simultaneously beating the top of the fruit with a wooden spoon. This will help the pomegranate release all its juice and seeds. Place the watercress to one side of the bowl, this will stop the warm carrots wilting the watercress and help it retain its bite. Lay the carrots to the side of the watercress, crumble some goats’ cheese over the top then add flaked almonds and pomegranate with and a final touch of good quality olive oil to finish.